If you are looking for a cost-effective, quick and easy to install fabric feature in your space that looks great, then fabric sails are the best solution. They can transform an indoor workspace from an uninspiring box room into an aesthetically pleasing and interesting atmospheric environment proving that minor changes can have a dramatic effect! 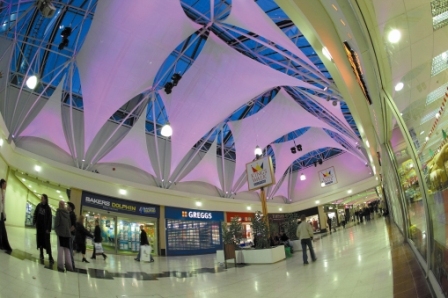 Whether its an office, school or shopping centre, tensile fabric features may well provide a solution. Interior fabric structures are commonly constructed from lightweight fabrics that can easily be stretched into double curvatures but in theory any type of fabric can be used to create a fabric structure. All fabrics have uniquely different qualities, from the translucency and texture of the material to varying costs, colour ranges, how easily the fabric can be printed on and importantly the fabrics fire rating. Cottons are the most economically viable material and are ideally suited to short term use as they are susceptible to staining and shrinkage. A soft and natural texture, cotton structures are available in a wide range of colours. Polyurethane coated glass cloth has a similar appearance to cotton but benefits from higher durability, while PVC coated glass mesh is very durable and acts as a theatre gauze or sunscreen. Silicone coated glass cloth is widely used for its high fire resistance and low relative fore toxicity but also tends to attract dirt. Different levels of translucent fabric and varying mesh densities throughout the fabric range can make fabric features ideal for controlling or enhancing light. Interior shade canopies can be used to reduce solar glare or to enhance natural illumination and reflect light throughout a building. The nature of fabric interacts well with articficial lighting as well as natural. Subtle use of light control and printing on semi-translucent screening can also create the illusion of depth and space where, in reality, none exists. Graphics may also be applied to interior fabric structures through lighting from above, below or even from inside the structure. From classic feature lighting to modern colour changing lighting, static structures can easily be made to look dynamic and even more exciting at the flick of a switch. Environmentally sound and energy saving designs can be individually shaped to the specifications of each project by Architen Landrells specialist technical lighting division. Fabric sail canopies can provide original ways of redefining open-plan environments as alternatives to standard ceiling and lining systems, either as bespoke partitions or sculptural elements to break up large spaces, as seen in the series of bespoke ceiling and wall linings at the Saga Call Centre. Our custom designed interiors include a range of versatile hypars and kites which are the most economical way of using fabric sculptures in your building. Quick and simple to install in existing buildings, these off-the-peg drop wire designs are available in a range of sizes that allow you to fine-tune their positioning. For a more bespoke end result, these systems can also be adapted to specifically fit your building and your needs. The Kingswalk Shopping Centre in Gloucester was transformed by fabric sails suspended in three separate areas of the indoor arcade to provide a cost-effective yet dramatic means of enhancing the retail environment. Interior fabrics also have acoustic properties and tensile fabric acoustic structures can have an astounding effect on the atmosphere of a wide open room. At Barclays Global Investors head office a series of Soft Cell hanging panels were installed to provide a suspended fabric ceiling feature and to dramatically improve room acoustics. 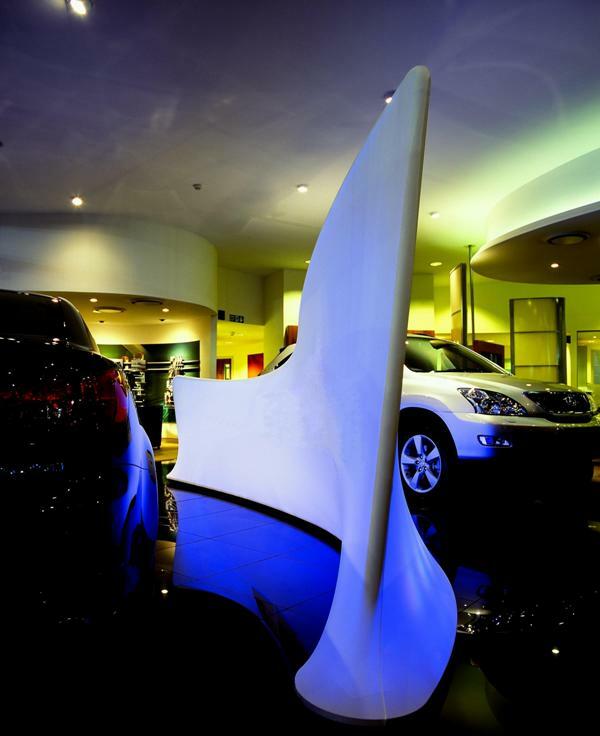 Architen Landrells extensive experience in the field of fabric sculptures means we can deliver an enormous range of original and varied visual effects to suit any design.